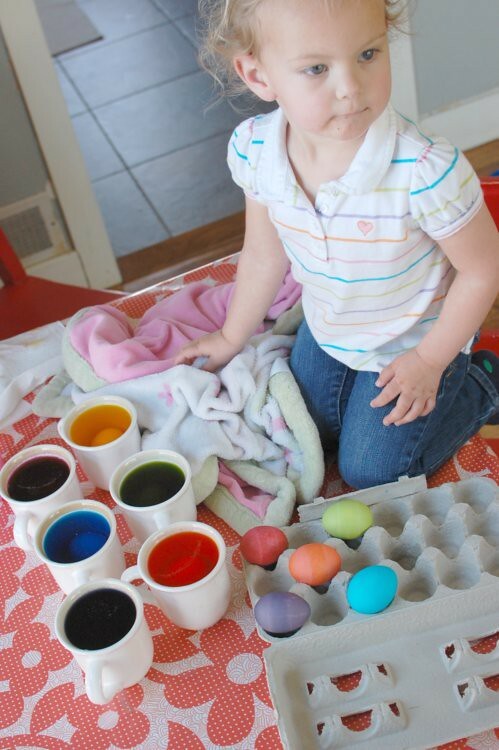 On Saturday Z-cakes and I colored Easter eggs. I'm a total micro manager when it comes to coloring eggs. It's kind of embarrassing but Z-cakes didn't seem to mind. On Sunday we all dressed up in our pretty clothes. And Z-cakes became a princess. N8tr0n made Sriracha deviled eggs which were totally delicious which was totally shocking to me. 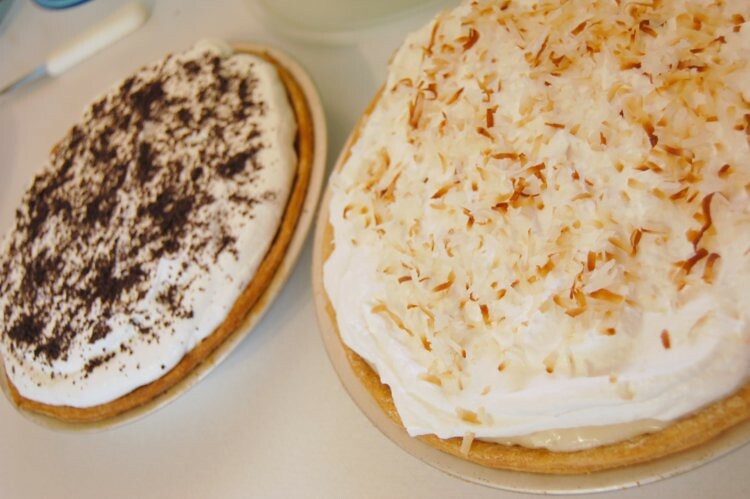 I made chocolate cream pie and coconut cream pie. Also totally delicious. and we tried to regulate the amount of candy that Z-cakes shoved into her maw. 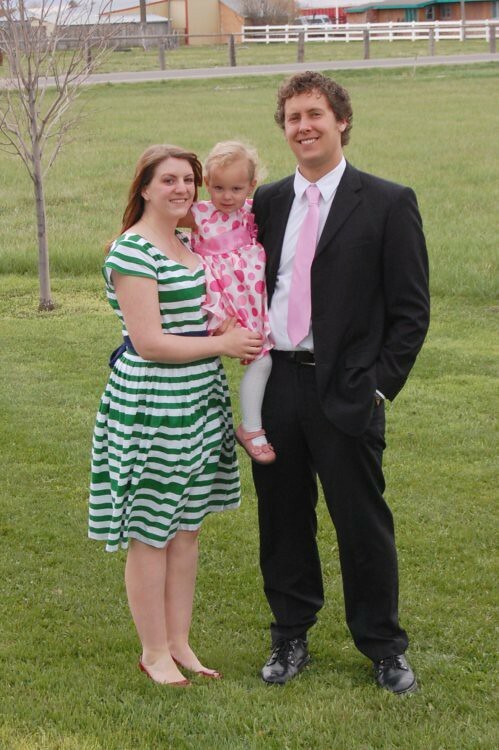 In other words, our Easter weekend was absolutely perfect. I hope yours was too. Way to go Spencer!!! She is totally a cutie. Looks like fun. 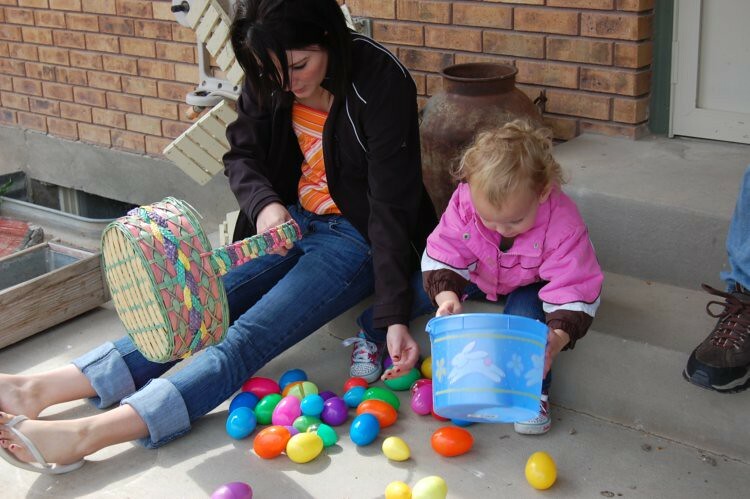 Love your pretty clothes, and that easter egg holder in the last picture. Love all the Easter pics...especially the pies. But that might be because I am going sugar free for a week and I am craving it like mad right now!!! Your family shot looks adorable!!! I am totally making those deviled eggs! Now I know what to do with all the colored eggs I have that no one will eat! Your pies look wonderful. My two favorites. 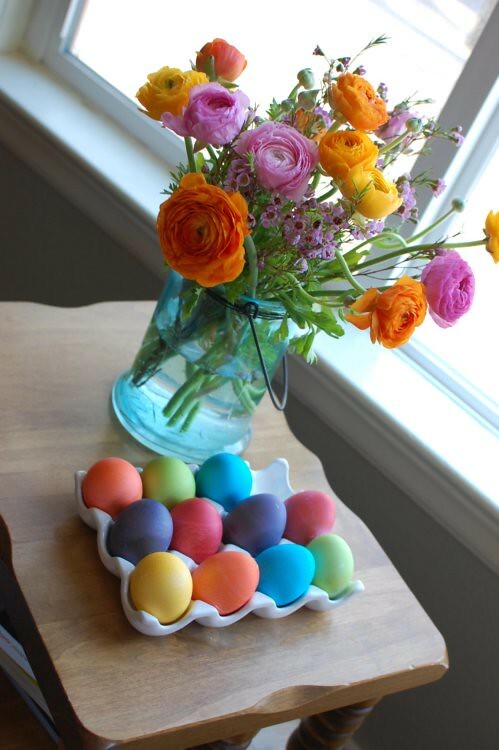 That last photo is killing me with the ranunculus (my favorite) and that egg holder! 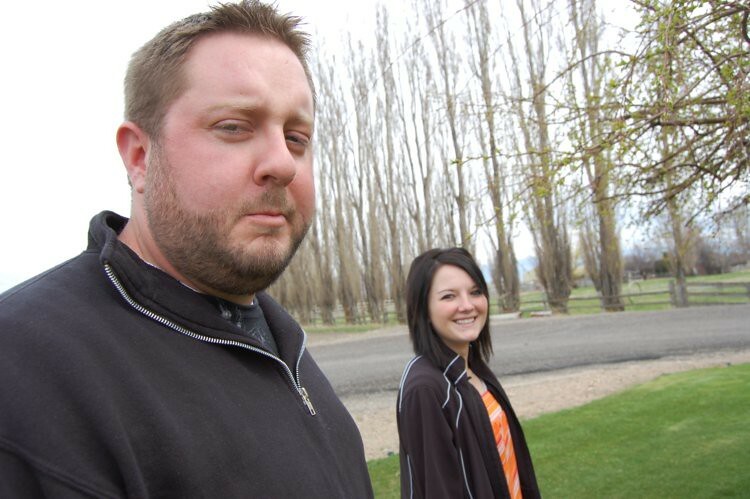 Spence's girlfriend is adorable. 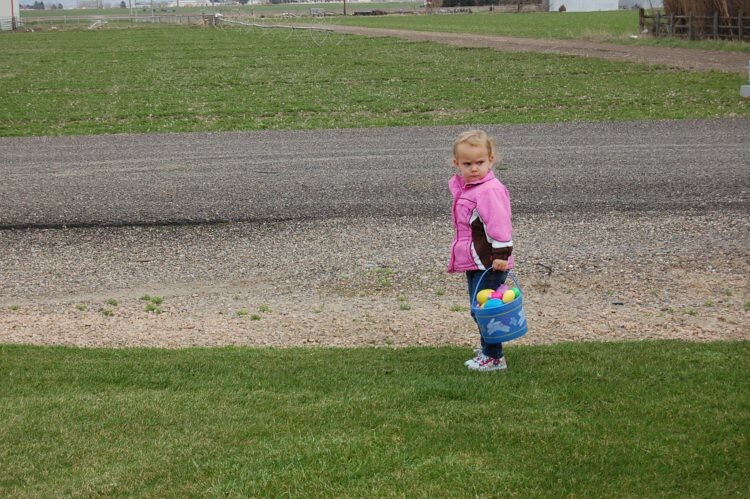 As is Z's angry face while hunting eggs. And I too love your egg holder. I just stumbled on your blog and wanted to tell you how adorable it is! 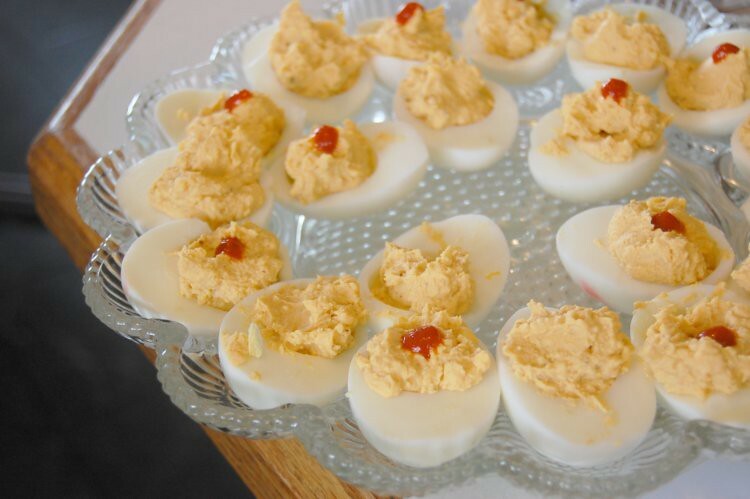 Also, SIRACHA DEVILED EGGS!!! Oh my word, must try that ASAP. Jon tried to spice up my deviled eggs by tossing on some tabassco. It was fine, but I'm thinking the sriracha would have been better - or maybe even my habanero jelly. You dare let Z hunt that close to the road?! I'm dying here! This year I finally fessed up that I HATE coloring eggs. It's just too much mess and unknown color and potential spillage for this mom. G drew weenies on all of the eggs with the wax - so they didn't show up until they were dyed. I'm completely kicking myself for not taking a photo. I can't believe you did TWO pies. You are a rock star. And are those ranunculus on your table?! Where on earth did you get those in Poky? I love your dress. Those pies look AMAZING. I love the gorgeous flowers, you have made me want to go find some for my table to help bring spring on. 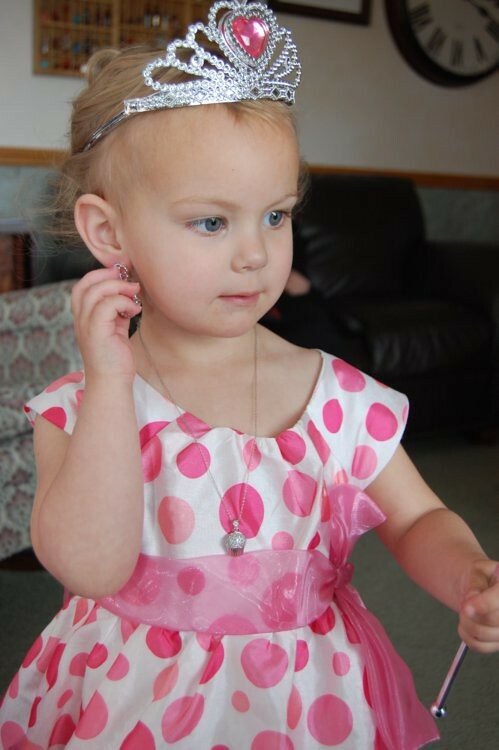 Z-cakes looked absolutely adorable in her pink polka dotted dress. So glad you guys had such an awesome Easter! Look at Z's hair! It's getting so long! Woo hoo! What a gorgeous girl. Sounds like the perfect Easter too me, especially with the overload of chocolate. And, Miranda, my love, you are beautiful! Love the dress. Holy Moly, Mandy! I LOVE your dress. I think I need one just like it! Also love your hub's pink tie. I love men in pink. Good taste! 1. You look fantastic in your Easter dress. 2. And your daughter is absolutely gorgeous in hers. Especially in the pic with her tiara. 3. I'm sorry your new fertility doc hasn't made a miracle for you yet. The waiting game is so very painful and I hope you don't have to wait much longer. 4. Thank you for all your nice comments on my pathetic attempt at a blog. You are so sweet! 6. I wish we lived closer too. And not just to bake cakes. Has Micalena told you about her business idea?